034 Oswego Iron Smelter (card made). Donor: Bickner Family Pictures [correspondence here]: Jan. 1913; Remains of old furnace and bridge on road to Oregon City. Just at the outskirts of Old Town, Oswego. Description Sepia photo. Road to West Linn. Imprinted on photo: 1866, Oswego Ore. Same image as 131 b,c,d, & 799. Transcription 034 Oswego Iron Smelter (card made). 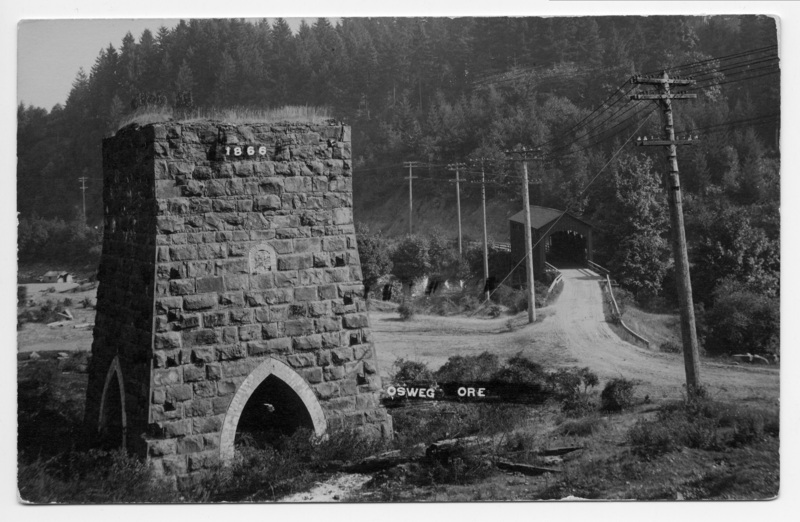 Donor: Bickner Family Pictures [correspondence here]: Jan. 1913; Remains of old furnace and bridge on road to Oregon City. Just at the outskirts of Old Town, Oswego. Physical Description H 3 1/2" x W 5 1/2"